Media: Soft glossy covers, A4 portrait format, printed on 36 good quality semi-gloss pages. Includes 2 pages of B/W artwork, 4 pages (1 gatefold) of 1/72-scale plans, many B/W + 4 pages of colour photos. Advantages: Excellent collection of photos of all marks, including some colour. Good 3-view drawings of the TF.1 (at last! ), TF.2 (with details of the T.3 trainer) and the S.4. Wyvern’s development, technical details and production well covered. Useful diagram and table covering the external stores variations. Disadvantages: In-service histories not covered (but you can’t have everything). w First propeller-turbine-powered aircraft to serve on carriers. w Only naval strike fighter with this propulsion type, to reach squadron service. w Prototype utilised the most powerful, and yet at the same time, the last piston engine developed by Rolls-Royce (the Eagle), as well as the first 8-bladed contra-rotating propeller system developed in Britain. w First Westland-designed a/c to serve with the Royal Navy since 1921 but paradoxically, the last fixed-wing aircraft produced by them. w The first underwater ejection in history, on 13 October 1954! Who could fail to be impressed by this unique machine? So a long-planned visit to Yeovilton’s Fleet Air Arm Museum, to see and photograph the only survivor (TF Mk.1 ‘VR137’), inevitably led to my purchase of this new book from the museum shop. The book begins with a history and background of the Wyvern’s inception. Interestingly, the RAF was apparently also expected to be a recipient of the type, but dropped out in order to concentrate on introducing jets (chance for some RAF’46 modelling here?). There then follows a technical description of the various marks, together with a useful table detailing; orders placed, serial numbers, production sequence, operating units and notes on the disposition of some aircraft. Note that although this book is a Czech publication, text is English language throughout. Most of the rest of the book consists of black and white photographs covering all variants, many of which I certainly have not seen before. There are four pages of colour photos, mostly detail shots of Yeovilton’s TF.1, but there is also one of an S.4 at Hal Far (Malta) and one of ‘VW870’ at the 1953 SBAC Farnborough display. The colour cover shots show; (front) Yeovilton’s ‘bird’ in 1991 (spurious EDSG over Sky – she’s now in prototypical NMF), and (rear) the two-seat T. Mk.3 ‘VZ739’ in 1950. Cockpit shots are also included – those of Yeovilton’s TF.1 being in colour, whilst those of an example S.4 are black and white. All photos are well reproduced and provide much interesting detail for the enthusiast and modeller alike. There are two pages of black and white ‘shaded’ aircraft profiles (shame they were not in colour), showing example markings for the various marks, and a cockpit diagram with key (only for the S.4 though). Finally, there is a drawing detailing the various external stores possible (including RATO/G) and their attachment, with an accompanying fitment table showing the permitted external stores permutations. This is backed up by a description of the Wyvern’s intended role and armament. No matter whether you love or hate the Wyvern, this is an extremely useful book bringing together a wealth of photographic and technical detail. If you are just curious, or intending to model the Wyvern (my Dynavector S.4 awaits a slot on the workbench at some point), this book will certainly add to your knowledge and appreciation. Possibly only a couple of things are missing; service histories of those machines that made it into service, and more diagrams, etc from service manuals. But that would have been an altogether different book (and not at the price of this one! ), so let’s not be picky. 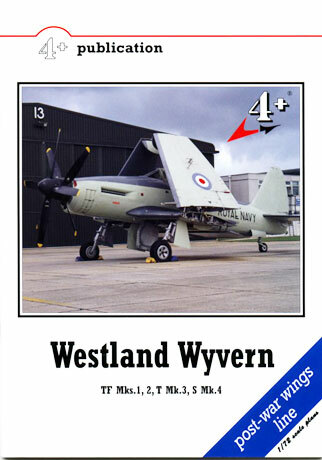 Recommended to anyone with a liking for Westland’s 10 ton, propeller-driven swan-song. Review copy courtesy of my wallet (I’ve warned you about this before! Wallet).